I've used Alternative Computer Systems several times over the course of several years, and have always been more than satisfied. The service is quick, thorough, and reasonable. "Very good communication. Seems to have fixed everything remotely. Recommend this company!" ""We've been using ACS for over 5 years and the service Kevin provides is excellent. He is very responsive and reasonably priced"
"Kevin is friendly, reliable, knowledgeable. prices are reasonable, and always get's the computer done on time." Simply the only choice in Computer/IT solutions. "Kevin is by far the best we've ever come across. Kevin is a tech's tech kind of guy. But he is so much more. He has the unique talent of learning each business he works with business. I've met many techs over the years who are excellent at their job, but fail to connect and have no understanding of a budget and the hard realities of small businesses. We are a small wealth management company and don't have normal 9-5hours. We never hesitate to contact Kevin after normal business hours and he always attends to our issues in a timely fashion. Kevin literally works around us. I've never met someone as calm as Kevin is. He is a true professional with extensive knowledge. We don't work with anyone else beside Kevin. I would recommend him and his team to anyone/anywhere/anytime. We can't speak highly enough of the work Kevin has done for us. We've been working with him for over 15 years and we hope many more! "Kevin is great at fixing almost anything! Highly recommended." "kn responded quickly to my email over the weekend and fixed my problem first thing on Monday." Alternative Computer Solutions is a top notch computer technology company that I would recommend to any individual or business. They are dependable and reliable. We have been doing business with them since 2004!!!! Their knowledge and service they provide is excellent. Kevin Jacobsen of Alternative Computer Solutions is the best in the business. He is very reliable as well as quick to respond to your problems and provide solutions and/or repairs. His services are priceless but his rates are extremely reasonable. Kevin responded very quickly-same day-to my computer emergency and got the job done quickly. Everything was done on time & professionally. Kevin saved us a few times...always prompt and efficient at what he does. My business depends on our internet connection. On three or four occasions Kevin was able to show up the same day and fix our problems quickly. Kevin has helped me out of several jams. I own a print shop and when I have computer problems, I'm pretty much shut down. Kevin works quickly and is very good at what he does. His prices have also always been fair. At Alternative Computer Solutions we provide competitive pricing for our clients on upgrades, we are at your call 24/7 for your convenience, we also offer service contracts. If your business needs to be setup with an internet and email connection we would love to help. We offer free pick-up and delivery available. We are fully certified and insured. Alternative Computer Solutions is able to provide its customers a complete range of superior Service and Support to help your organization minimize down-time. Our technicians are fully trained and certified based on the manufacturer protocol, and are capable of providing solutions to the most complex technical problems. 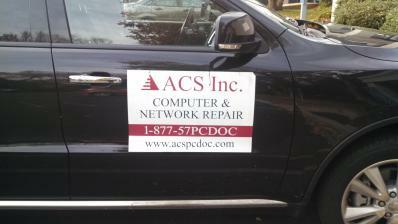 ACS service is legendary, and our goal is complete customer satisfaction. ACS support capabilities are unparalleled in the northeast. We have the personnel, expertise, and facilities to keep you in full operation at all times. Are you getting the most out of your investment? How can you minimize downtime, achieve optimal performance, and make sure your system is protected and secure? Are your computers not booting, windows crashing, freezing, re-booting? Is your modem not working? We fix both hardware and operating system problems whether it’s Ms-dos, Win 3.X, 95, 98, NT, 2000, XP, Vista and Windows 7, 8. We also setup Internet and Email. We offer DSL and Cable with wall wiring which is not a problem. At Alternative Computer Solutions our systems’, designs and redesigns, integrates and evaluates Local Area Networks (LANs) and Wide Area Networks (WANS) that utilize Microsoft Windows and Novell based operating systems. Services range from providing current systems evaluation to bridging multiple networks via wireless connections and the Internet. Part of being a successful integrator is being able to train and support a client once a network is installed. Alternative Computer Solutions is a successful integrator that works closely with its clients through design, development, implementation and maintenance of a network. For more information on how we can help develop and maintain you network, please contact us. We are able to help you and your firm with repairs to most makes and models of laser printers. Our technicians are widely acclaimed in the area of printer repairs and maintenance and have been servicing home users, small business and professional printing firms for many years. If it has anything to do with a Macintosh repair we can support it. Our services range from the basic repair or maintenance of an older Mac to the specialized needs of high-end graphic and design configurations. Minimize your downtime, improve your efficiency and protect your cash flow, with an on-site maintenance agreement. An experienced engineer will come to your premises equipped to repair your computers, printers or network. © Alternative Computer Solutions. All rights reserved.